Disclaimer/Disclosure**These statements have not been evaluated by the Food and Drug Administration. This product is not intended to diagnose, treat, cure, or prevent disease. Links below may contain affiliate links, in which case, any monetary compensation goes to raising our family. My mom works in the restaurant business, so I’ve heard of her getting burned quite a few times, but she recently called and said that she got burned really badly and that it almost immediately blistered. She sent me a picture and I was shocked at how bad it looked. I told her yes! 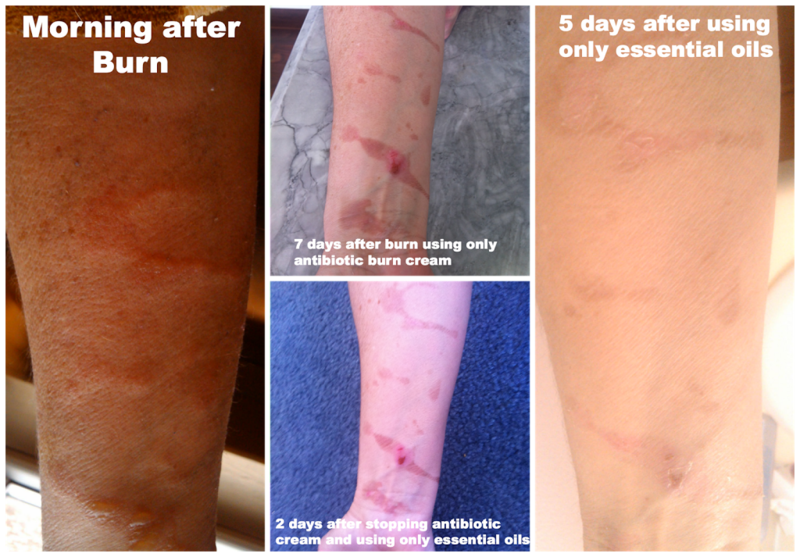 She was coming to visit me a week after the burn happened and said that she would use the antibiotic burn cream she hand until then. The week passed and visit day came. She showed me her arm and I couldn’t believe how bad it still looked. We quickly whipped up a blend of Peppermint, Melaleuca, and Lavender oils in a carrier oil (we used olive oil because that’s what I had on hand, but I would recommend fractionated coconut oil for added healing benefits). We applied this every 4-6 hours during the day. She was only visiting for two days, so we took another picture when she was leaving and you could noticeably tell a difference. She then sent another picture three days after she left and I was blown away by how amazing it looks. I highly recommend this blend based on the results I’ve seen first-hand. * This blend is not recommended for children under 6 due to peppermint. Learn more about essential oils safe for kids. Disclaimer: This information is meant only for educational and informational purposes only. These statements have not been evaluated by the Food and Drug Administration. Products, recipes, and/or information contained here are not intended to diagnose, cure, treat, or prevent any disease. We strongly advise our readers to do their own research and partner with their holistic/health care provider on any decisions. If you are pregnant, nursing, have a medical condition or are taking any medication, please consult your physician before using essential oils. **Update — At the time of writing this post, we were informed that ingesting oils was safe. Since that time, we no longer believe, and fully discourage, the consumption of internally ingesting any oils for any reason unless you are under the direction are care of a certified aromatherapist/herbalist. Please do not internally consume this recipe. Mercury, formaldehyde, egg protein, sugar….The list goes on. These are just a few of the ingredients listed on the CDC’s website that go into the flu shot that millions of people receive every year. I, personally, do not want to be putting things like this in my body, but more importantly, I don’t want to compromise Baby Skibbles developing immune system at such a young age. And I don’t even want to talk about flu shot side effects. So, I started looking for flu shot alternatives. 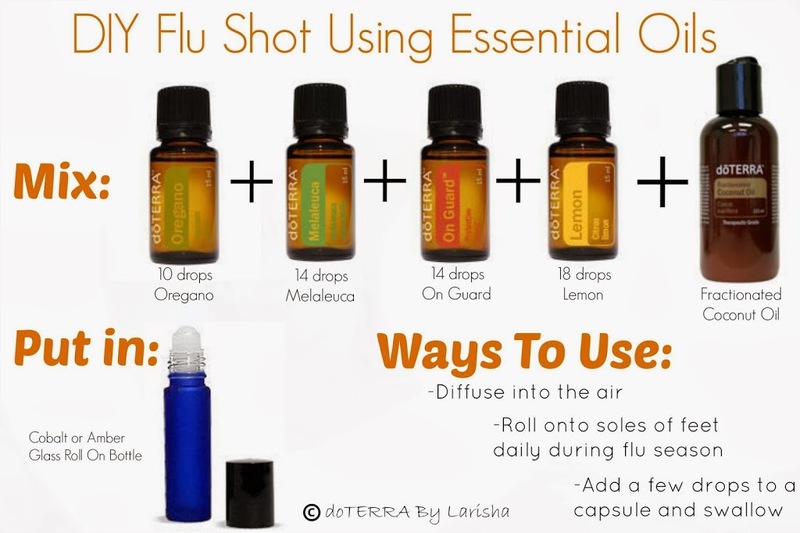 One of the reason’s we started using doTERRA certified therapeutic grade essential oils was because we wanted a natural way to combat illnesses in our home. Flu season is currently in full swing and my personal Facebook page is full of friends and family talking about illnesses their family is going through. But all of this can be solved by combining just a few different oils. * This blend is not recommended for children under 10 due to the eucalyptus and rosemary in On Guard. To use on children two and above, replace the On Guard with more Oregano. Learn more about essential oils safe for kids.